We are going to take a look at a few upper extremity (UE) accessory exercises that should be used by all CrossFit athletes, and overhead athletes in general. I can’t tell you how many athletes we have treated who are super strong in certain planes of motion (dysfunctional positions) and super weak in others. We see this A LOT with posterior chain muscles of the UE, or muscles located on your back. How many times have you worked on scapula stabilizer endurance during a WOD? How much activation are you getting from your low trap during HSPU? If you haven't been thinking this way or working on these muscles, you need to. Many times we find that athletes who have shoulder pain with overhead lifts often have a muscle imbalance. The muscles in the front of the body are strong and tight and the muscles in the back are long and weak. Complete recipe for disaster! What we need is balance and symmetry between these opposing muscle groups. Here are two exercises we make sure are part of our CrossFit athletes programs to help improve this balance and reduce pain. The first accessory exercise is the bent-over row. This exercise involves horizontal pulling which is a key for Crossfit. Many boxes don’t adequately focus on strength in this plane. We are looking to perform this exercise with your middle and lower traps engaged. Start with the bar on the ground with your hips hinged, back flat. Pull your shoulder blades down and back, away from your ears. Pull bar from the floor while keeping shoulder blades down and back. Do not arch your back. Perform 2 sets of 8-10 reps at a light/medium weight. Another exercise that should be part of every routine is the prone Y. This exercise also targets those lower and middle trap muscles that are so important in reducing shoulder impingement and labral tears. This exercise is great because it also effectively gets you in an overhead position with much lower load on your rotator cuff muscles. Start with your arms in a Y position, like you're doing the YMCA dance. Squeeze your shoulder blades down and back, away from your ears. Raise your arms off the floor (it could be 1-2 inches!) while keeping your shoulder blades down and back. Do not arch your back. Perform 2 sets of 8-10 reps.
Those of you who have pain with these motions or have tried these and still have pain need a full evaluation by one of our Doctors of Physical Therapy. Pain limits your movement/motion and limiting movement/motion directly affects your lifts. 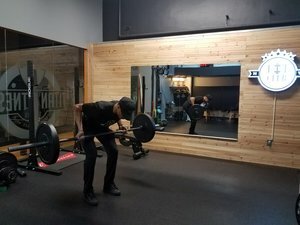 Get back to PR’s and pain free lifting with Fit Club. Don’t wait for the pain to get better on its own, It Won't! Call us at 646-875-8348 or email info@fitclubny.com to schedule your evaluation today.